Terry Holtz, manager, technical sales at Enel X, offers insight on how California’s changing utility rate schedules and distributed energy storage landscape are creating opportunities for energy storage. California’s rising adoption of solar power has fundamentally altered traditional dynamics on its electric grid. In response, the state’s electricity providers are moving ahead with rate changes that will have a significant impact on electricity costs and the financial performance of behind-the-meter solar photovoltaics (PV) on commercial and industrial facilities in the state. 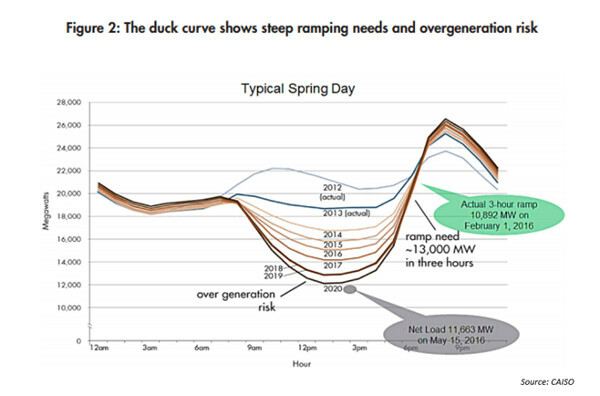 Since delivering electricity during periods of high demand is cost-intensive, utilities in California have long implemented time-of-use (TOU) rates that followed the grid’s traditional load curve — which ramped in the morning, peaked in the mid-day hours, and gradually decreased in the afternoon into the evening. Higher rates were applied during “on-peak” and “part peak” hours to accommodate the cost of the mid-day peak, while lower rates were applied during “off-peak” hours at night and in the early morning. Lost revenue: The decline in mid-day demand has eaten into a strong source of revenue for natural gas generators, while an abundance of solar power has lowered electricity prices across the board — occasionally resulting in negative prices. Higher costs: Supplying the demand spike in the mid-afternoon/early evening hours requires the use of natural gas peaker plants, which are expensive to run. Traditionally, TOU rates accounted for the costs to meet the daily peak in demand. The more electricity customers used during on-peak hours, the more money they spent on TOU rates. Now that the peak in demand has shifted to a later period in the day, California’s utilities are adapting their TOU rate schedules accordingly. 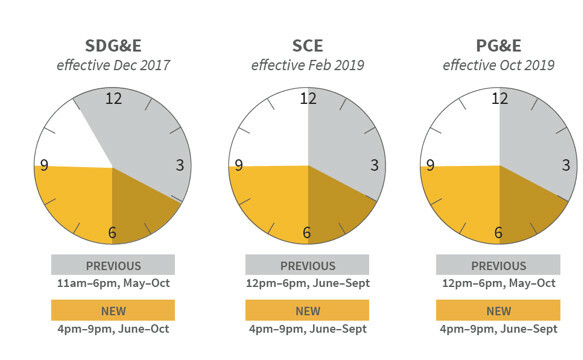 San Diego Gas & Electric (SDG&E) shifted on-peak hours for its summer season to 4 p.m.-9 p.m., from its previous schedule of 11 a.m.-6 p.m. Pacific Gas & Electric (PG&E) and Southern California Edison (SCE) are expected to implement the same schedule for on-peak hours in 2019. For energy consumers, the shift in utility rate schedules represents a significant change to the business case for standalone on-site solar PV — while also creating an interesting opportunity for behind-the-meter energy storage. Under the new TOU rate schedules, solar power production will largely occur during off-peak hours and provide little relief during on-peak hours. However, the ability to charge an energy storage system with low-cost power — whether sourced from the grid during off-peak hours or from an on-site solar PV system — enables large energy users to consume that power during on-peak hours and other opportune times. Over time, this can significantly reduce operational costs and provide businesses the flexibility to capitalize on other opportunities, such as reducing demand charges and increasing earnings through demand response and other incentive programs. Over the long-term, energy storage also positions large consumers to adapt to these kinds of grid-level challenges as they emerge. 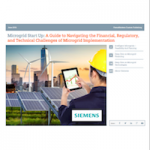 Our new whitepaper, co-authored by Enel X and Microgrid Knowledge, calculates the impact of the shift in TOU rate schedules on sample standalone solar PV, standalone energy storage, and combined-solar-plus-storage projects in California — and explains how energy users can maximize the financial performance of these assets over all available value streams. To learn more, download the special report, California’s Changing Time-of-Use Rates: Calculating the Impact on Behind-the-Meter Solar PV and Energy Storage. Terry Holtz is manager, technical sales, at Enel X. Great article. Please remember buildings have thermal load and electrical loads. Energy should be stored in the form of its end use for efficiency and the best ROI. Thermal storage for thermal load, electron batteries for electrical loads. Great article.